It's not often that I smoke a cigar that I would consider to be "perfect" in every category, but believe it or not I think I smoked one yesterday. I've got to tell you that this wasn't your run-of-the-mill cigar though, it was hand-rolled by Felipe Sosa, world-renowned cigar roller and a creator of THE MASTER cigars for Toraño Cigar company. Yes indeed, this was a very special cigar and I've been itching for an opportunity to smoke it ever since it was handed to me. Details? Well, there's the problem, I don't have any. 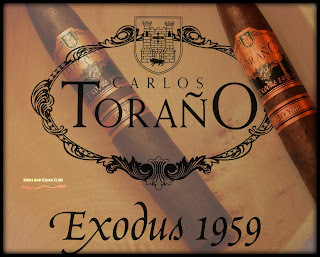 My friend Alex with Toraño Cigars gave me the lowdown on how special this cigar was, but idiot me wasn't paying attention. Oh well. You'll just have to trust me on this one. When I say that it was perfectly rolled, that's an understatement - it was masterfully rolled. 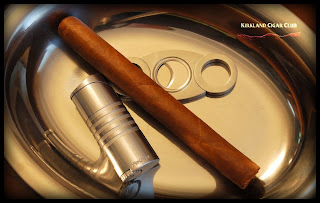 Have you ever picked up a cigar and you just knew that it was going to be a big hit because of the way it felt in your hand? This was one of those cigars. Solid, good weight, perfect size (Churchill? ), flawless wrapper, everything that only a perfectionist would know when he rolled this "hunk of love". Yes, that's right, I wasn't holding a cigar, I was holding a masterpiece. First puff - Heaven... Medium to full-bodied, smooth as hell, excellent draw, perfect burn, plus it's a major smoke bomb. I loved it! You know it's nice when a cigar lives up to your expectations. 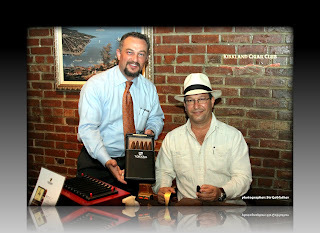 PS - The photo below was taken at the Toraño cigar event at the Vertigo Club by my good friend Herman "Sir Godfather". Great shot of Alex and Felipe from Toraño Cigars! Thanks again John for putting the event together for us - what a great time! We hope everyone is enjoying their holiday weekend. Join us this Tuesday, May 31 as we feature Crown Royal whiskey and Partagas cigars. We'll have drink specials, appetizers and prizes along with a great cigar special at the perfect time to stock your humidor for the warm weather! Mark your calendar and invite some friends to join us on Tuesday, June 14 for our "Celebration of Summer" event featuring the new Hoyo de Monterrey Reposado en Cedros cigar and Tanqueray Gin. Of course, we'll have great prizes, drink and cigar specials along with a fantastic venue to enjoy the weather, including the Sno lounge balcony with some unbelievable views of the Cascades! Mark your calendars for this one! If you are unfamiliar with the cigar, it's the result of a unique immersion process in which the cigars are aged in cedar shavings for eight months, which imparts a wonderful cedar flavor and aroma to the cigar. They are available now at Lit. Come by and try one! After two and half years of hosting a weekly cigar event in Lit every Tuesday, we are going to discontinue our weekly Tuesday Night Cigar Club event at the end of June. Instead we are going to focus our efforts toward holding bigger monthly events in the Sno Lounge along with our biggest cigar event yet, the Washington Cigar & Spirits Festival, which will take place this fall in our casino ballroom. Stay tuned for more info. It's exciting to look ahead to bigger and more exciting events, but we also want to thank those of you who have come out on Tuesdays and made the Tuesday Night Cigar Club such a success. We've made a great many friends, and our hope is that by focusing on bigger events in these bigger spaces, we'll be able to accomodate a larger group of people. Thank you again for all of your support. You know I thought Washington State had it bad when it comes to smoking laws - Guess what? It's worse in Canada! Sure you can buy your favorite Cuban cigars up there, but try to find a place to smoke them. Smoking is not permitted in any public space or building, including pubs, bars, lounges, clubs, restaurants or malls. I know what you're thinking, what about Casinos and private clubs (like our Vertigo or the Lit), isn't it the same as here in Washington? Negative! The BC Ministry of Health says: "These establishments are not exempt from the smoking ban. Prohibiting smoking provides a level playing field with other hospitality establishments in our province and protects people from the hazards of second-hand smoke." And then there's the matter of price. 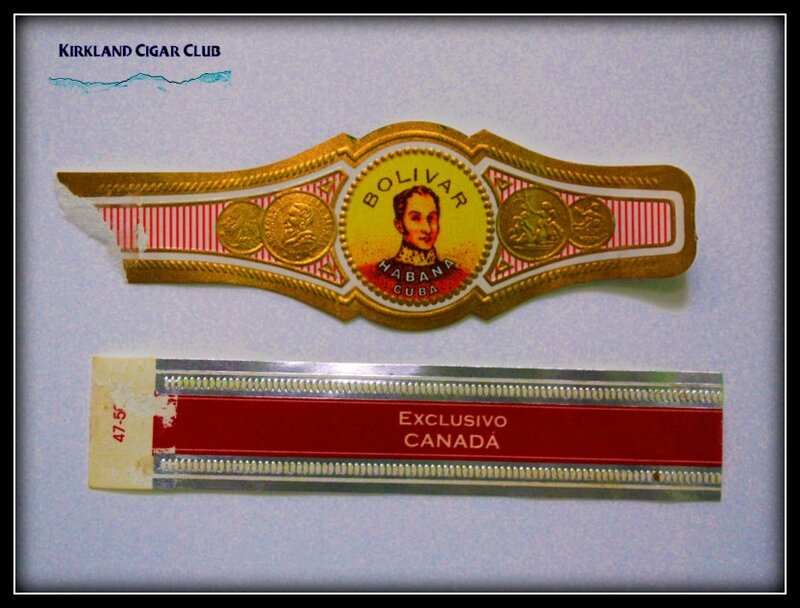 Have you ever bought a Cuban cigar in Canada? Holy Shito! Spendy is an understatement. I was talking to my tobacconist the other day and he said that the price is so high because of us (Yanks) - with the embargo we're willing to pay just about anything for something that we can't have at home. So last night I was down at the Tobacco Patch for my Friday night cigar. We lucked out, it wasn't raining - thank God! 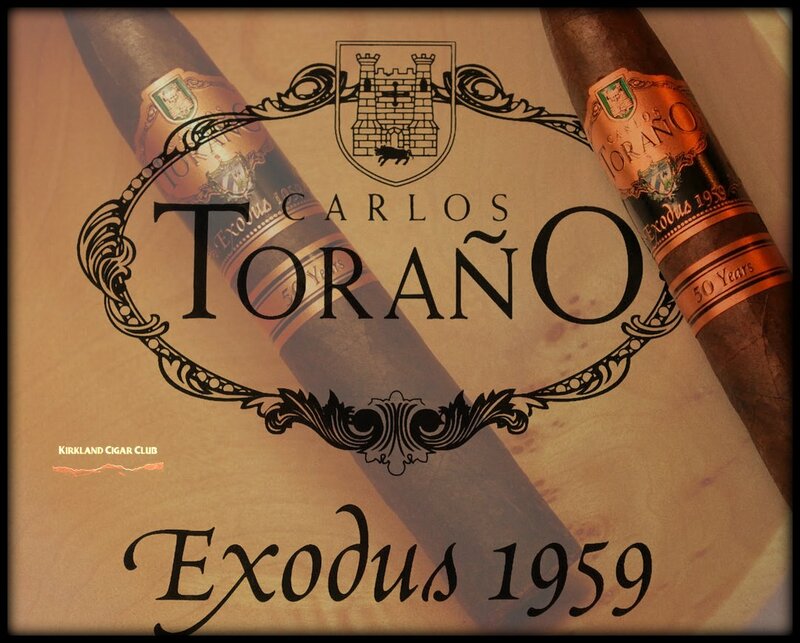 I've been looking forward to trying this Toraño, Exodus 1959 - 50 years cigar all week. My good friend Alex with Toraño Cigars gave it to me a few weeks back. Anyway, on the way over to the Patch, my lovely wife and I stopped for a mocha first. Weird thing about downtown Kirkland - there's a million places to get coffee, but only two are open after 9 PM. No kidding. We swung by Caffe Ladro, it's just across the street from the Patch. PS - Alex, if you happen to read this, take a look at the photo below. That's my primary humidor that I've had for years. Recognize the name? Totally forgot that I had a Toraño humidor. Is it possible to need a vacation from a vacation? I've been super busy the last couple of weeks entertaining some friends from South America - took them all over the place, Las Vegas, Vancouver BC, Victoria BC, Whistler BC, and just about every shopping Mall and tourist attraction around King County. I'm beat, but I must admit that I had a really good time - these guys were pretty cool. OK, so did I smoke any good cigars on my vacation? Yes and no. First the Yes. 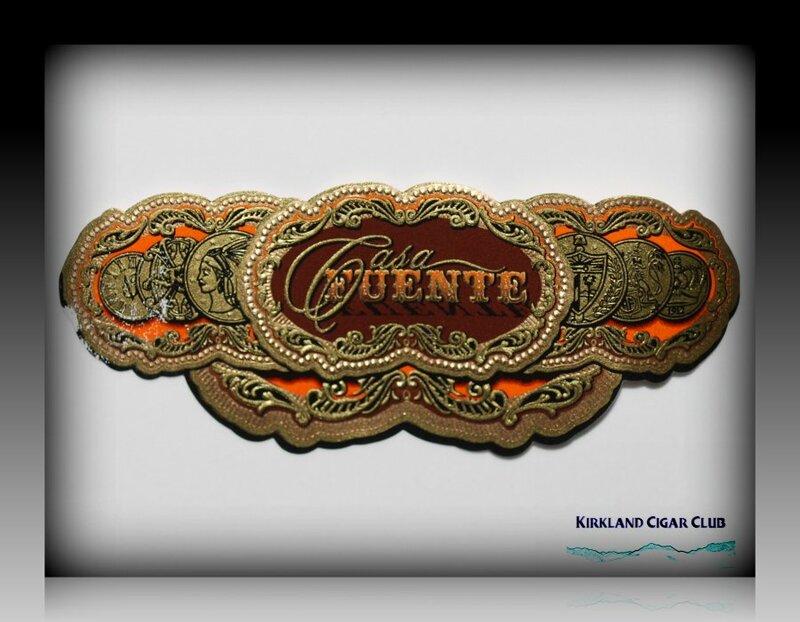 While I was in Las Vegas I stopped by Casa Fuente Cigar Bar over at the Forum - Nice place! Anyway, I asked the gal there if they had any cigars that were new or maybe unique to this store and she said: "yes indeed!" Kewl - I gotta have one! Since I was with my non-smoking friend at the time, I decided on a robusto - I would have loved to have made an afternoon out of this, but I didn't want mi amigo to get too bored. The gal was nice enough to cut and toast the cigar and then handed it to me for the final fire-up. My thoughts? WOW! What a nice cigar! Rich, smooth, full flavored, loads of smoke and a perfect draw. Jeez, what more do you want! I loved it! We sat up at the bar and had a few drinks while I enjoyed this exceptionally good cigar. My friend, the non-smoker, said he really enjoyed it here. Is that possible? OK, now onto the cigar that I thought was going to be a stellar smoke, but turned out to be on the average side. While I was in Victoria BC, I discovered a quaint cigar store downtown called "Old Morris Tobacconist" (est.1892). Excellent selection of Cuban and non-Cuban cigars, very knowledgeable friendly staff and prices on par with the rest of Canada. I picked out a Bolivar Exclusivo Canada Cuban on the Tobacconist recommendation. So what did I think? Meh... nothing special. Reminds me of a Montecristo No.2 Dominican. Not bad, but not quite the full flavored taste I thought it would be. I liked the Casa Fuente cigar a helluva lot more than this one. Oh well, you'll never know how good a cigar is unless you try it, right? For the money, don't bother with this one. We have a very special Tuesday Night Cigar Club on May 24. We'll be featuring Macanudo and Excalibur cigars and giving everyone who buys any three of our featured cigars a golf wallet that includes a cutter, tees, golf pencils and a Macanudo Cru Royale cigar! We also have a great grand prize to give away - a Callaway Club Macanudo golf bag! We're excited to announce our next "big" Tuesday Night Cigar Club event in the Sno Lounge. Join us on Tuesday, June 14 from 5-8pm for our "Celebration of Summer" event featuring the new Hoyo de Monterrey Reposado en Cedros cigar and Tanqueray Gin. We're pleased to announce the arrival of Lucille, the IPA from our friends at Georgetown Brewery, the guys who brew Manny's Pale Ale which has been a favorite at Lit for years now. This beer has a great hoppy flavor with some outstanding citrus notes that would hold up to even the spiciest Nicaraguan cigar. We're sure you'll love it! Try one the next time you're here! A quick correction: The Kentucky Derby begins at 1 p.m. Pacific on Saturday. Come on down to Lit to enjoy the race, great specials on Woodford Reserve bourbon and get a souvenir glass with your Mint Julep. We have some cool prizes to give away as well. Thanks to everyone who came out to our Fiesta de Mayo event on Tuesday in the Sno Lounge. It was a great success and we are busy planning our next Sno Lounge event for Tuesday, June 14th. Meanwhile, our Tuesday Night Cigar Club moves back into Lit next week, Tuesday May 10 as we feature Hennessy Black along with a great special on La Gloria Cubana's new Artesano de Tabaquero cigar. The party starts at 6, but unlike in the Sno Lounge, space is limited, so come early! Thanks for your continued support. On behalf of our entire team, we appreciate your business! We'll have live Mariachi music, great drink and cigar specials and plenty of prizes. It's going to be a great time, so tell your friends to come join us as we take over the Sno Lounge on Tuesday! On Saturday, May 7, be sure to join us for the fastest two minutes in sports, the 137th annual Kentucky Derby! Enjoy all the race coverage while sipping on Woodford Reserve, the official bourbon of the Derby. The festivities start at 2 p.m. and we'll have specials on Woodford Reserve, including Mint Juleps served in a collectible souvenir glass! It's the perfect time to spotlight this fantastic cigar, Cigar Aficionado's #14 Cigar of 2010, because this is the blend that we'll be featuring during Tuesday's Fiesta de Mayo event in the Sno Lounge! The Triple Play is an all maduro cigar with a wonderful sweet and nutty character and flawless construction that has been a huge hit at Lit since it came out last Fall. Don't just take our word for it, see what the folks at Cigar Aficionado had to say in their glowing review. We'll have some great deals on the Triple Play during the event, including a free $50 Montecristo Signature cutter and 6 free cigars with any box purchase! There's no better time to stock up on this exquisite cigar with the warm weather on the horizon! Click on the image to the right to see the event flyer. How can I describe this? Let me see... Have you ever been invited to a friend's house for a big Thanksgiving dinner and you were the only one there with a different last name, or maybe you went to your girlfriend's house for the first time to meet her folks, do you remember that feeling you got when the family went out of their way to make you feel welcome, how they introduced you to everyone as if you were now a part of their family too? Well, if you ever have the pleasure of meeting Alex with Toraño Cigars, you'll feel like you just became part of his big family too. He's an amazing guy! I mean really, I'm a nobody, but he treated myself and everyone else in the group as if they were long-lost brothers home for the Holidays. Truly a charming and charismatic guy. OK, so what led up to all this? Friday night my lovely wife and I were invited to the Toraño cigar rolling event with Master Roller Felipe Sosa over at JnJ Cigars. The event started at 6 PM, but of course we didn't get there till 8 o'clock. We're always late to these things. Anyway, it wasn't raining so I expected to see a boatload of people out in front of John's (JnJ) store smoking cigars, but no one was out there and the main entry door to the store was closed. That's weird, it's usually wide open for events? Well to my delight the event wasn't in the cigar store, it was upstairs in the Vertigo Club. SWEET! If you've never been invited to the Vertigo Club (private club), it's a cigar smoker's paradise. I'm serious! If I were a member I think I'd probably be there more than my own house. Well, maybe... :) Anyway, we went up stairs to the club and found it to be jam-packed full of people! So just to give you a glimpse of what was going on - To our left as we entered the room was the Toraño display table, lots of goodies. Right next to that was Felipe's table - he was masterfully rolling cigars for one of the prizes that was to be given away later in the evening. I asked Felipe how many cigars he's rolled in his lifetime? He chuckled. Further down is the bar, fully stocked - there were also trays of sweets at the bar - my wife said that chocolate thingy was delicious. The club has plenty of big leather sofas and chairs throughout the room, of course every seat was taken tonight. What was really impressive was seeing a hundred aficionados having a good time and enjoying fine Toraño cigars. John, Bill, Alex and all the others that put this event together, you are to be congratulated! Fantastic job guys! 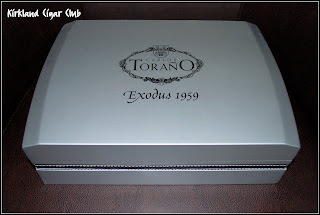 So cutting to the chase, what did I think of Toraño cigars? Honestly I've got to tell you that I've been smoking them all weekend long - Friday at the Vertigo Club, Saturday at the Patch, and Sunday out on my back deck at the house. GREAT cigars! I smoked the Master and Single Region blend, and I'm looking forward to a couple others that I've got in my humidor. You know this was the first time that I've smoked a Toraño cigar - I must be living under a rock or something? 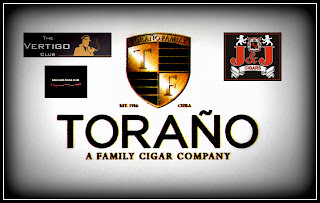 Anyway, I can guarantee that you'll be seeing more Toraño reviews on the Kirkland Cigar Club blog in the near future, guaranteed. Have you bought your tickets for the Seattle Cigar Expo yet?